At Stainton C of E Primary School, we believe that design and technology helps to prepare children for the developing world and encourages them to become curious and creative problem-solvers, both as individuals and as part of a team. Through the study of design and technology, they combine practical skills with an understanding of aesthetic, social and environmental issues. Design and technology helps all children to become discerning and informed consumers and potential innovators. It provides children with a greater awareness and understanding of how everyday products are designed and made. We use a variety of teaching and learning styles in design and technology lessons. Teachers ensure that the children apply their knowledge and understanding when developing ideas, planning, making products and evaluating them. We do this through a mixture of whole class teaching and individual/group activities. All children’s ideas are treated with respect and they are encouraged to critically evaluate their own work and that of others. 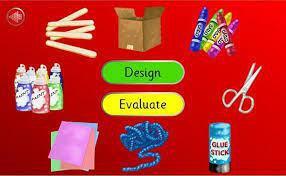 They have the opportunity to use a wide range of materials and resources, including ICT. We teach design and technology to all pupils, whatever their ability, and provide learning opportunities that enable them to make progress. We do this by setting suitable learning challenges and respond to each child’s needs. We strive to support individual needs and enable children to achieve their full potential through appropriate challenge and questioning. Children are encouraged to think and work independently and collaboratively evaluating, extending and improving their ideas. design and make assignments allowing children to apply their knowledge, skills and understanding when developing their ideas and creations. In EYFS, we develop children’s skills, knowledge and understanding of the world around them as an integral part of our work. Planning relates to children’s current knowledge, skills and interests and links to the objectives set out in the Early Learning Goals. handling appropriate tools and construction material safely, with increasing control. The planning is completed through a cross curricular approach ensuring that design technology has a link to the topic/s being studied. use a range of resources including computer design. In design and technology, teachers assess children’s progress by making observations during lessons and discussions, marking workbooks and evaluating end products. Teachers make progress judgements against learning objectives and staged success criteria. At the end of a unit, children review their own and each other’s work, focusing upon an evaluation of the finished product and how effectively it meets the learning objective. Due to the practical nature of design and technology, evidence of work undertaken by children can be in the form of teacher’s notes or as a photographic record. Samples of the design process and end product are also valuable evidence. Design and Technology - progression of skills through Key Stage 1 and 2.